By using paradigms for custom programs, the programming staff made specifications and the actual task of programming much easier. Maintenance was also made much easier. Every big software company, like Oracle, IBM, SAP, and Salesforce, spends millions of dollars a year for advertizing. No organized group promotes the concept of writing one's own custom software. The possible lack of in-house talent and the likelihood that extraordinary talent will leave puts the typical VP in a bind. Buying IBM used to be the acknowledge safe choice. Buying a package is a current safe choice. Likewise, in reading Gartner's and other reviewers of software, there are more suggestions to buy 'best of breed.' No one spends much money to promote writing software. A simple analysis of many software packages reveals a simple architecture for most core functions. On the software side, a small team of four or five designed and implemented a broad array of programs. 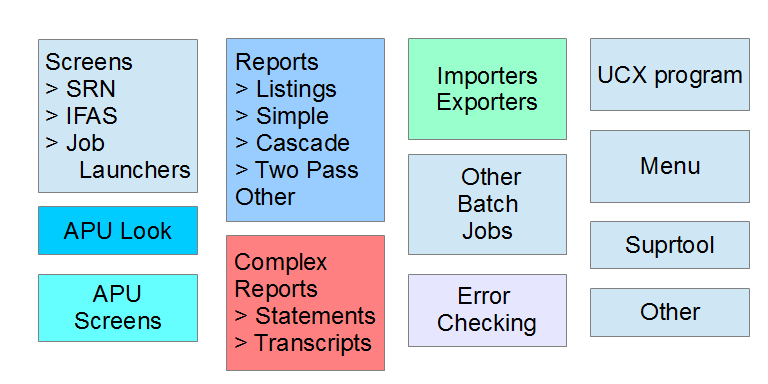 A module usually has one or more input screens; a few reports; a few batch jobs. Many modules bridge the gap between an outside service and APU. Other modules extended the SRN Student System and the BiTech Accounting System. By our logging statistics, we had about 100 active daily screens, 100 regularly active extracts or reports; 400 occasional reports; many rarely used reports, and close to 350 input screen. University Calendars and Feeding Schedule25; another bad choice. the Bitech module and its clerk did well.Buying Razor's Edge led to bleeding buy those trying to hold it. Cash Registers and Payment Types; we let the student store buy a package, and the chaos began.